Before you start your validation strategy, you need to have at least simple but intelligible landing page with clear call-to-actions, email grabbing forms with saving to google spreadsheets. Don’t forget to setup Facebook Pixel for fb retargeting. And don’t forget to integrate analytics (we recommend Google Analytics + Mixpanel or Amplitude or Heap). And double check the load speed, it dramatically affects conversions. This landing page gives you the opportunity to capture the name and email address of any readers who are interested in learning more about what you're planning on building — based on a brief description written on your landing page. This landing page will be a foundation for the proof of concept you'll be building in the next step anyway. Within your guest post that's topically relevant to what you're planning on creating, you'll tastefully link back to your landing page so that readers can click through to learn more and sign up for updates. Again, you don’t have to build a complex website before guest posting. Your landing page can be done via Squarespace or Tilda. It will be more than enough to start with. What's most important about the basic landing page you build, is that you're able to 1) write a brief description of your upcoming solution, and 2) ask readers to sign up with their email address for updates. Collect their email addresses by using a Google Form, which will store them neatly in a Google Sheet you'll be able to refer back to later. You don't have a ton of blog content of your own, so you "can't" do this, right? Not quite. If you think you don't have the content for writing a guest post, you're mistaken. Take all the bits and pieces of your market researches, conversations you've already been having with your target market, identify the value propositions they've been resonating with most and start expanding on each of those points. Success with pitching guest posts begins with choosing realistic targets, but never doubt the power of asking for what you want — tons of other people have also been able to land high value guest posts without any "street cred" of their own yet. Now let's dive deeper into 5 step process for cold pitching guest posts. This landing page can be in the form of a simple blog post, sales page, product description, video or otherwise — this is the destination that'll serve as home base for when you're ready to go out and pitch guest posts. Create a shortlist of 10-20 different publications, blogs and brands that you think you can realistically land a guest post with — on a topic closely related to your landing page. Vet these websites and make sure it looks like they accept content on your topic and that they have engaged readers for the subject matter, otherwise it's not the best utilization of time. Once you have the list, rank everyone on it based on how much traffic you can drive to website from a guest post (you can use SimilarWeb for this). Next, break down the sections of your original post and start outlining what a more detailed post could look like — expanding upon each of these sections from your original. For example, from our post How to improve business with no capital, we could choose #8 “Be social. Use social media on the list” and outline a more detailed post that expands upon actionable strategies. Now, you can start to pair up these new post outlines with the target websites you want to get a guest post published on. Find the right point of contact at your target websites. This is key. You need to pitch a real person and make sure it's the right person. That's someone who 1)cares 2)can do something about your guest post idea. For that reason, we always look to target a marketer, writer, editor or blog manager at the destination we’re looking to secure a guest post on — these people will all be on the same page when it comes to the constant need for solid content and they'll either have or know the people with the decision-making power to grant a guest post. Most of the time before pitching someone on a guest post, you need first go back to your original landing page (or post on blog) and add in a relevant link to a piece of content on the blog of the target destination you are trying to get a guest post on. That way, when you reach out to the marketer, writer or editor, you can keep the message related to just your mention of them in the post on blog — providing value first. Ask them to give it a quick look to make sure you’re citing them properly and linking to the best possible destination for them; two things they'll care about and it's not a big ask. That gets them to your website where they can see what the post is about. Then once they respond, you can pitch them on the guest post topic that you believe to be most relevant to their readers. This strategy will also set you apart from the 100 other people that email in every day asking to guest post. Make several guest posts, get traffic to your landing page, measure conversions and the number of signups. If you have not enough signups, think about changing your CTA (the easiest way) or even target audience (the hardest way). Do it until your idea is validated. 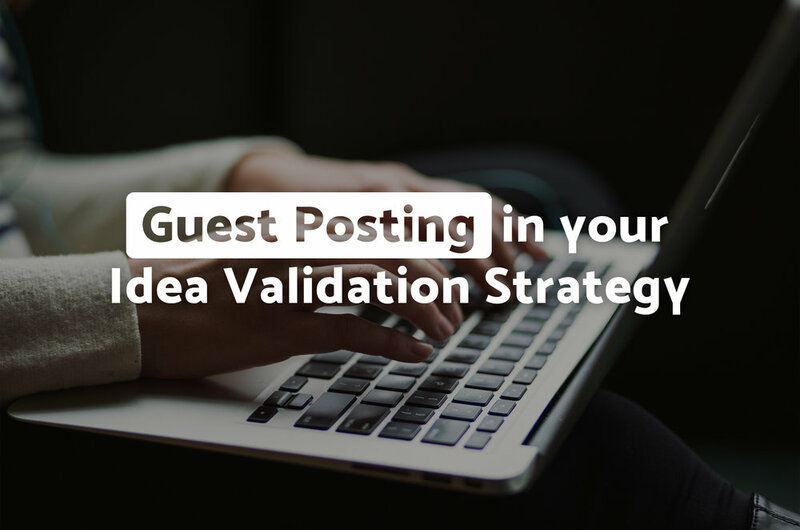 If you don’t know how to build the Idea Validation Strategy - drop us a line and we will be able to help you with it. It’s not as hard as it seems.